Wall cladding can add a whole new dimension to home interiors courtesy the myriad materials and finishes it is available in. Wall cladding is a wall covering material that aims to make the wall look like it is made of a different material than it actually is. Apart from boosting the décor through its large variety of designs, colors and materials, cladding also offers some sort of resistance and protection as well as increases the life of structural materials. Interestingly it increases the service life of the structure and also increases value of the building. In addition it can improve thermal, acoustical and natural daylight performance. Nikhil Tiwari, Founder and Designer, Topstona says, “natural stone based cladding provide the essence of natural environment with their tactile property. Adorning interiors with cladding is a good way to give new life to otherwise dull and lifeless walls.” Stone, tile, wood, metal, vinyl, concrete and wallpaper are the different types of wall claddings which can be used for several interior spaces. In a modern Indian living room finished with plush sofas and pretty accent pieces, the exposed brick wall adds an earthy dimension in form of wall cladding. “The brick backsplash stands out beautifully in a modular kitchen. Bathroom decor is slowly becoming a popular trend in India and you can extend stone wall cladding idea here as well. The stone clad step in a garden complements the dry-stacked boundary wall, thus making for a beautiful vignette. 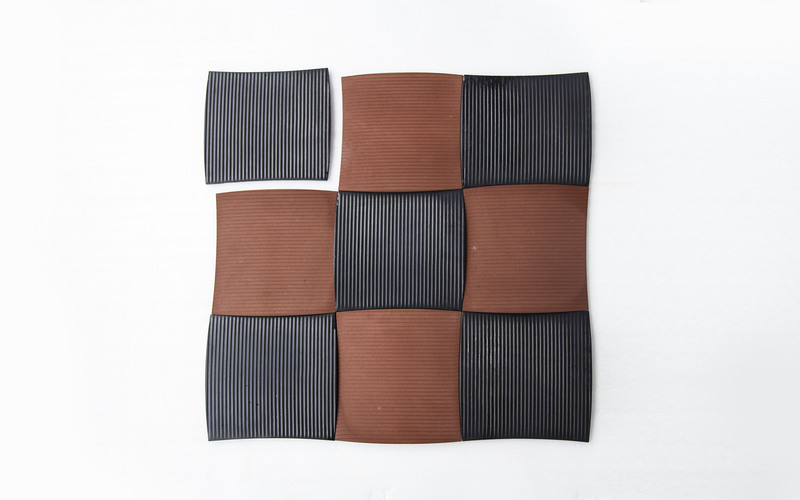 It is a versatile decor trend and can be used in almost any part of your home. 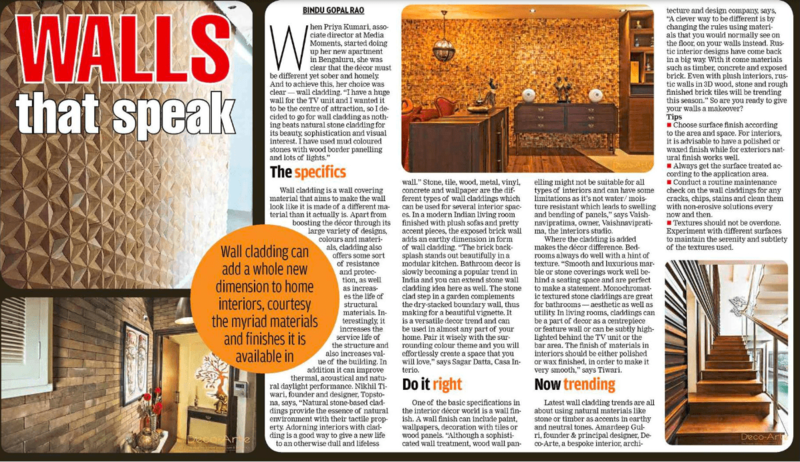 Pair it wisely with the surrounding color theme and you will effortlessly create a space that you will love,” says Sagar Datta, Casa Interio. One of the basic specifications in the interior décor world is a wall finish. A wall finish can include paint, wallpapers, decoration with tiles or wood panels. “Wood wall panels relish a rich inheritance as a sophisticated wall treatment and can be used as a stout design statement for your interiors. 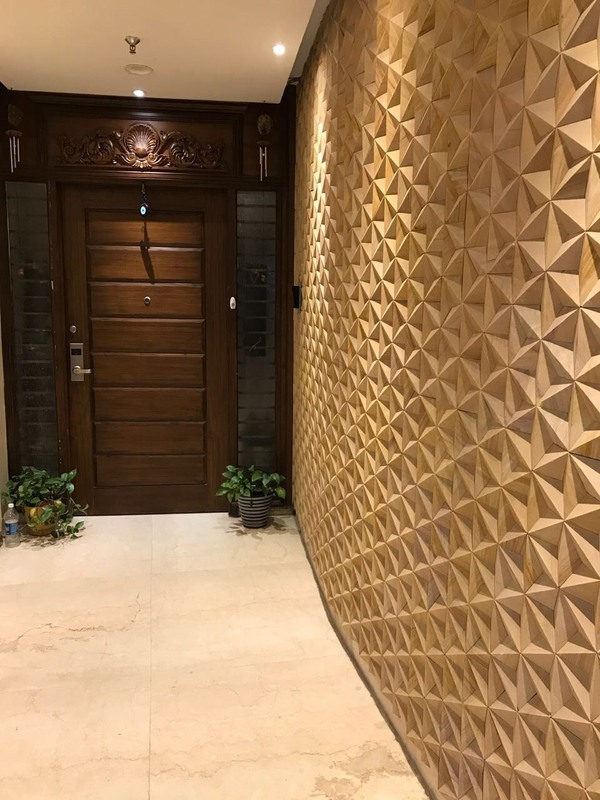 Although wood wall panelling might not be suitable for all types of interiors and can have some limitations as well as it not water/ moisture resistant which leads to swelling and bending of panels,” says Vaishnavipratima, Owner, Vaishnavipratima-the interiors studio. Where the cladding is added makes the décor difference. Bedrooms always do well with a hint of texture. “Smooth and luxurious marble or stone coverings work well behind a seating space and are perfect to make a statement. While monochromatic textured stone claddings are great for bathrooms- aesthetic as well as usage wise. While in living rooms, claddings can be a part of decor as a centrepiece or feature wall or can be subtly highlighted behind the TV unit or the bar area. The finish of materials in interiors should be either polished or wax finished in order to make it very smooth,” says Tiwari. Latest wall cladding trends are all about using natural materials like stone or timber as accents in earthy and neutral tones. 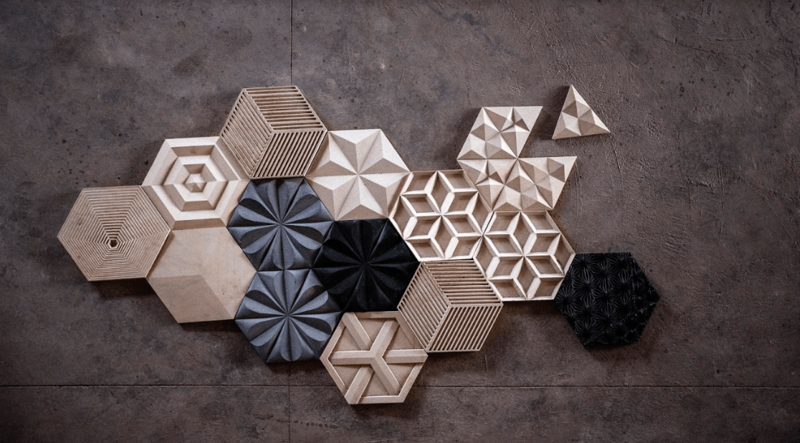 Amardeep Gulri, Founder & Principal Designer, Deco-Arte, a bespoke interior, architecture and design company says, “we live in a world with limitless possibility when it comes to construction materials, and sometimes it pays to be creative. A clever way to be different is by changing the rules using materials that you would normally see on the floor, on your walls instead. Rustic interior designs have come back in a big way. With it comes materials such as timber, concrete and exposed brick. Even with plush interiors rustic walls in 3D wood, stone and rough finished brick tiles will be trending this season.” So are you ready to give your walls a makeover? Choose surface finish according to the area and space. For interiors it is advisable to have a polished or waxed finish while for exteriors natural finish works well. Always get the surface treated according to the application area. Conduct a routine maintenance check on the wall claddings for any cracks, chips, stains and clean them from dirt with non-erosive solutions every now and then. Textures should not be overdone. Make sure to experiment with different surfaces to maintain the serenity and subtlety of the textures used.